Breaking away from the San Juan city limits the most scenic drive is up coastal Highway 187. Along Highway 187 is Pinones, where beach goers beat a path to because of the wonderful strip of sand. There are still traces of hurricane Hugo which hit in 1989. But the best thing we liked about Pinones is the paved bike path that runs some six miles through mangroves, rock formations, and hugs the coast. You’ll see the signs off the Highway, and note a mile-long gravel parking lot. This is your cue for the most popular part of the beach. It is here that an offshore rock ledge forms an almost mile-long natural pool where families come to enjoy the sandy bottom and super calm water. And it’s never more than four feet deep! Now you know where to take the little ones, or just bring some cold drinks and chill out in paradise. Hard choices. 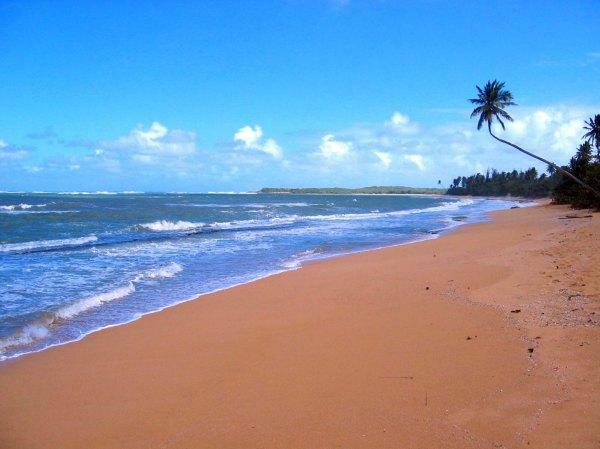 If you get to Pinones Beach early, you’ll be able to stake out one of the few coconut palms. If you don’t, make sure you bring some sort of shade. Further east, we noted miles upon miles of sand dunes with coconut palms dotting them. It would seem you could hike along them for a day, but you’d probably be trespassing at some point. Make sure you take a canteen and a camera if you go. Because of the rock ledge, swimming isn’t the best. But we found a nice swim area called Vacia Telega at the far eastern point of Pinones Beach, about where those dunes start. Don’t worry though. You can tan forever, or fish, as many do. Walk eastward to the point – you’ll enjoy the view. One last tip – bring some drink and food as there isn’t always the occasional beach vendor here. But down at the west end of the strip, we did find El Pulpo Loco, with seafood and guess what?! Mountain bikes to rent! Make sure you ride the trail. Notes – some cases of car thieves in the area. Make sure you’re not the only one at the beach.